Have you been wondering what those little letters on your coins mean? They’re called mintmarks. A mintmark is used as a means of identifying which mint struck that coin. As you may know, there are branches of the United States Mint throughout the United States, though the “headquarters” are in Philadelphia, the city where United States coins were first officially struck for circulation in 1793. At the time, Philadelphia was the nation’s capital city, and that is where U.S. law permitted federal coinage to be struck. As the United States grew, so, too, did the geographic coverage of our national minting facilities. 1838 was an important year in this regard, as three new mints opened in Charlotte, North Carolina; Dahlonega, Georgia; and New Orleans, Louisiana. The Charlotte and Dahlonega mints would strike only gold coins while the New Orleans Mint produced all types of coins. The Gold Rush drew tens of thousands of people to the West Coast, many of whom concentrated near San Francisco. A new mint would open there in 1854, striking coins for a growing West. The growth and early success of the silver mining industry in the West would similarly create population centers in places like Denver, Las Vegas, and Phoenix. A mint was built in Carson City, Nevada and would come online in 1870, striking both silver and gold coins. Years after the Carson City Mint closed, the “Mile High” city of Denver would see its own mint begin striking coins in 1906. In 1937, the United States Mint facility in West Point, New York, opened. It would strike circulating Lincoln cents for more than 30 years. The first West Point mintmark would be seen in 1984. Get the magnifying glass out! 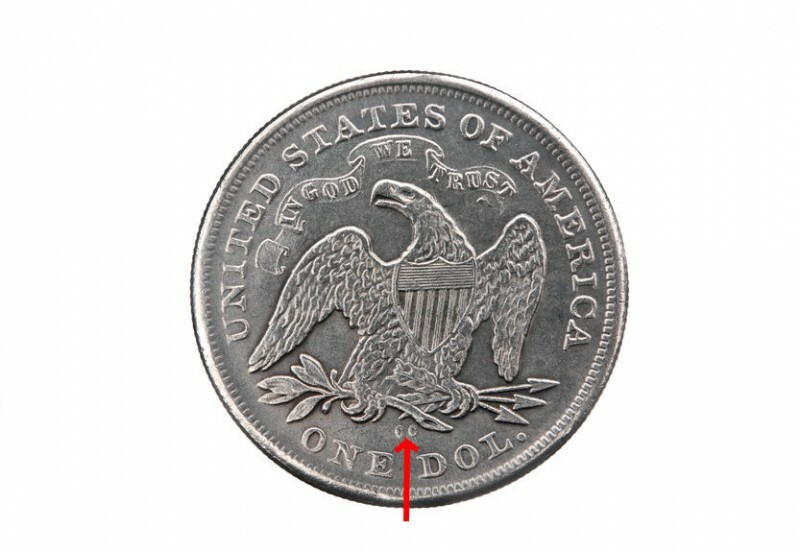 Many times, mintmarks are hard to locate on U.S. coins, and sometimes they aren’t even there at all. In fact, Philadelphia wouldn’t even have its own mintmark until 1942. Most Philadelphia coins minted before 1980 don’t have mintmarks – there’s more about this below. “C” mintmark – Charlotte, North Carolina Mint; this rare mintmark is seen on gold coins minted from 1838 through 1861. “CC” mintmark – Carson City, Nevada; the “CC” mintmark was placed on some gold and silver coins from 1870 through 1893. “D” mintmark – Dahlonega, Georgia; this mintmark was seen on gold coins from 1838 through 1861. “D” mintmark – Denver, Colorado; this is the second “D” mintmark, which would not first be seen until 1906. “O” mintmark – New Orleans, Louisiana; this mintmark is seen on gold and silver coins from 1838 through 1861; after the Civil War, the “O” mintmark would appear on silver and gold coins made from 1879 through 1909. “P” mintmark – Philadelphia, Pennsylvania; the mint has been officially striking coins since 1793, but its “P” mintmark would not debut until 1942, when it was first seen on the Jefferson wartime nickels – some of which had “P” mintmarks until 1945. The 1979 Susan B. Anthony dollar would be the next coin to bear the “P” mintmark, followed by all Philadelphia-minted coins greater in denomination than 1 cent beginning in 1980. “S” mintmark – San Francisco, California; this mintmark has been placed on all types of coins since 1854 and in recent years has become synonymous with proof coins, which are primarily struck at this mint; other mints, however, do strike proof coinage on occasion. “W” mintmark – West Point, New York; the West Point mint has operated since 1937, but its mintmark would not be used until the 1984-dated $10 gold Olympic coin was made. The West Point mint most often strikes commemorative and bullion coins, though in addition to striking un-mintmarked Lincoln cents, it has made a limited number of Roosevelt dimes with the “W” mintmark. What About U.S. Coins Minted from 1965 Through 1967 – Why Don’t They Have Mintmarks? Have you ever noticed that none of the U.S. coins minted during the years 1965, 1966, and 1967 have any mintmarks? This is because the nation faced a coin shortage in the early 1960s, and, incorrectly blaming coin collectors (really, it was silver hoarders who were removing 90% silver coins from circulation at that time), the U.S. government decided to remove mintmarks to discourage coin collecting activity. This policy was in place during 1965, 1966, and 1967, meaning none of the billions of U.S. coins minted at that time have any mintmarks. While the Philadelphia, Denver, and San Francisco mints were all striking coins during that time, none bear mintmarks. It’s therefore impossible to tell where any of these coins were struck. Mintmarks were restored to U.S. coinage in 1968. However, some non-Philadelphia coins made since the 1960s have been struck without mintmarks. This is principally the case with some circulating coins, such as Lincoln cents made at the West Point Mint during the 1970s and 1980s.